What will your branch be doing to help grow the union this September? Bertie Russell (New Forest District Branch, Branch Secretary): We are holding an open meeting for our members at New Forest District Council. We’ve got guest speakers attending, including our regional officer talking about our pay and a presentation on the history of women in trade unions. Hayley Garner (Southampton District Branch, Branch Secretary): Our branch is holding a ‘welcome home’ party for members and non-members about to be brought back in–house from Capita, after SCC leadership decided to end its outsourcing contracts. The party will include everything you’d expect – cake, bubbles (alcohol free) and balloons. Francesca Lambert (University of Southampton branch, Chair and Casework Co-ordinator): We’re balloting around pay in Higher Education so that means a branch meeting, posters in buildings, leafleting in mornings, sharing videos using the branch social media and stands on campuses. Dave Francis (Eastleigh branch, Unit Rep Housing and Development): Eastleigh branch are holding an engagement/recruitment event in the council, based in the staff café on 11th September. 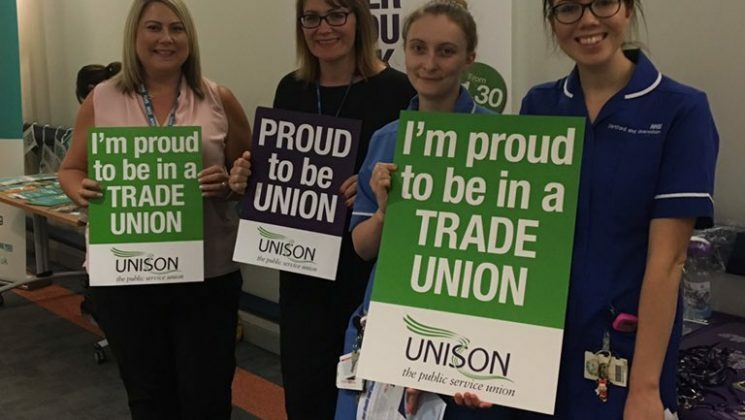 Sarah Conway (Portsmouth Health Branch, Branch Administrator): We are holding a stall at Queen Alexandra Hospital in the Theatres area on 11th September. We’re also running a drop in advice ‘surgery’ on 12th September. Why is it important to build a bigger membership specifically where you work? Hayley: Capita staff TUPE’ing either back to SCC or over for the first time will now receive the benefits of working for an organisation that negotiates regularly and openly with trade unions, as opposed to one that doesn’t. To ensure we can still do this, it’s vital that staff join today. Francesca: We think reaching our target membership is achievable due to the threat to pensions, jobs, and continually low pay offers in the sector. It’s also important we grow due to the scrutiny the branch and other campus unions are receiving from certain quarters, which is best described as adversarial. But there’s strength in numbers. Dave: It’s important to build a bigger union to support the viability of the Branch, thereby enabling it to continue to represent members. Sarah: More members means more voices that can be heard. It’s important that the views of NHS workers are heard as well as politicians. Ben Martin (Southampton District Branch, Local Organiser): At a time when funding is still being removed from local authorities, and cuts are continued, it is vital that trade unions are strong to protect workers from the worst effects. Bertie: As we’re facing cutbacks, like many other councils, it’s important in order to protect jobs and services. We need to maintain a big and active membership to achieve this. What are the national threats that you are concerned about? Hayley: I’m concerned about the Conservative Party’s threats to workers’ rights, the potential for the equality act to be rolled back and increased outsourcing. Francesca: Poverty in work is becoming more prevalent. I’m also concerned about Brexit of course and how this will affect universities and jobs within it, and particularly for those members who are from the EU. Sarah: NHS cuts. These put staff and patients at risk. Bertie: The two big issues for me are housing and general cut backs. We need affordable housing, stable and reasonably paid jobs and public services that are properly resourced. Ben: Personally – austerity, and any rollbacks to workers’ rights as a result of Brexit. Dave: The continued restructuring of local Government, which is resulting in stretched resources. It also means that some staff are too busy to give time to union activities, including putting themselves forward for the Branch Executive. We need to help our members to become more active. How will building a bigger union where you are help you to push back on these national issues? Ben: Unions can still negotiate for better terms and conditions and secure existing rights for members even if those members are no longer protected in law. Building a bigger union will help us do this. Hayley: The larger our union, the larger the ability to leverage power against decisions that will harm workers. Workers should be an active participant in decisions that affect them and a union is the best way of ensuring that. Bertie: A bigger union will mean that we are stronger – and hopefully to help prevent cut backs from being finalised or at least from being as damaging as they could be. Francesca: We need to do more about the EU workers. I asked a colleague from Southampton District branch to come in and talk about Brexit after we’d seen Keir Starmer at National UNISON conference last year. The rep we asked to speak shared the platform with him. However, it was hard for members to attend because they are in low paid jobs like catering, cleaning, student union facilities and Halls. I’d like to bring more of these workers into the union to help support them. Sarah: More members means more awareness of UNISON. It also means more subscriptions, which means more money to invest in supporting our members and in the education that helps our reps carry out their role. Dave: More members will create of a greater critical mass of people who are hopefully willing to get involved – including campaigning on the issues that matter locally. Not a member of UNISON?